Fans of historical romance are in for a treat with the launch of MAXIMUS - book I in the Imperial Desire series. 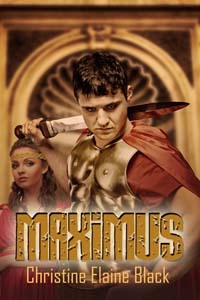 Set in ancient Rome, Maximus is the story of an exiled soldier and the woman he wronged years ago. Exiled to the countryside by the Roman emperor, Maximus Octavius is confounded by the brittle countenance of the woman he's willing to befriend. She's afraid, and he's determined to find out why. But helping Carissa and her son means confronting the guilt of his long-forgotten past and stirring the silenced passion in his heart.Can Maximus win Carissa before fear and revenge tear them apart forever? Four cubits away, a man idly leaned against a tree, watching her with a carefree grin on his face. Carissa held fast to the knife, estimating her chances at removing it before he reached her. “I’m looking for my boy, nothing else.” Her pulse raced, and her mind swirled in turmoil. She swallowed down her fear and held his gaze, desperately wanting to run away but knowing he would catch her easily. “He is not here, as you can see.” The man’s intense blue eyes burned into hers, hungry for something she could name but preferred to forget. “I’ll be on my way.” Rooted to the spot, she trembled. If she passed him, she would be unable to defend against an attack. Congrats on you new release. Been looking forward to reading it. I love reading unusual settings in historical romance. This sounds great! Congratulations on your new release!